See that tiny speck just to left of the bluish orb? That’s a planet. It’s one of the best direct images of an exoplanet we’ve ever seen, and it’s made all the more remarkable given that it’s a whopping 1,200 light-years away. Although you can’t see it, there are actually two planets in this remote star system, dubbed CVSO 30. Four years ago, astronomers used the transit method (where an orbiting planet causes a dip in the host star’s brightness) to detect the first planet, which is parked quite close to its host star. This inner planet requires just 11 hours to make a complete orbit and is located a mere 0.008 au (744,000 miles) from its T-Tauri star (a young, bright star that hasn’t quite entered into its main sequence).  Astronomers have now detected a second planet (the one shown in the photo), and they did so using direct imaging. To do it, they combined data from the ESO’s Very Large Telescope (VLT) in Chile, the W. M. Keck Observatory in Hawaii, and the Calar Alto Observatory facilities in Spain. Unlike its companion, this second planet, dubbed CVSO 30c, is exceptionally far from its star. In fact, it’s so far that astronomers aren’t entirely sure if it even belongs to this planetary system. It’s at a distance of 660 au, requiring a mind-boggling 27,000 years to complete a single orbit. For comparison, Neptune is located 30 au from our Sun. The astronomers speculate that the two planets may have interacted at some point in the past, shooting one away while the other settled in its tight orbit. Given its brightness, there’s a good chance it’s a Jupiter-like planet. Rocky planets tend to be darker and not very reflective.